As with any outdoor activity the weather plays a part. With an open race like The Celtic Crossing the weather affects everything. And as an added dimension the weather and sea states off Lands End can change very quickly and often do. It is very hard to predict much more than a few days in advance if the weather window is going to open for us. The locals say, if you can see the Scilly’s from Lands End it is going to rain, if you can’t see the Scilly’s; it already is raining! The one prevailing wind direction is South West and as luck would have it that is our ideal direction. 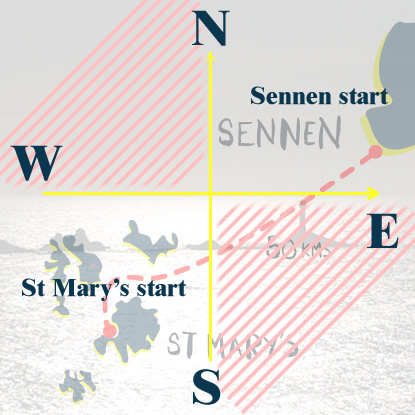 As you can see from the diagram, a South Westerly will give the competitors a really good down-wind run directly into Sennen. A North Easterly wind would mean a start from Sennen and a bitterly cold event. While the sea state is a little more compliant with the wind whipping up shorter but steeper runners to push the paddler’s along, there is not really enough reach to get a very organised swell running, meaning the paddlers will have to be on their ‘A’ game to maximise the bumps and stay on course by the short messy swells. While we try our best to maximise conditions we do not control the weather and sea states – if an Easterly or North Easterly wind is blowing it is possible to revers the course for the smaller craft. In the event of a reverse course the call will be made 48hrs prior to the start and adjusted timings will be sent to competitors. If adverse conditions are scheduled we have the option to delay the start by one day leaving on the Sunday rather than the Saturday. Unfortunately, the bigger craft (V6 outriggers) will already be on the Island making it impossible to run a reverse course. Below is the event schedule for either direction. 7.30pm – all the crews should arrive within an half hour period passing the Harbour Wall Sennen to complete their crossings. 1:30pm – all the crews should arrive within an half hour period passing St Mary’s Harbour Wall to complete their crossings.